Tuesday December 26th 1893 Will helped me put out the washing this morning. I finished up the work and in the afternoon worked on my mat some. Fanny and her Mother called. I was up town just before supper. Spent the evening at home. Wednesday December 27th 1893 Will and I took an early start to drive out to Hedges. I looked over the house again and fell better satisfied. The more I think of it the more I believe I will enjoy living there. It was one oclock when we got home. Will helped me take the clothes down after dinner and I dried them by the stove and did some ironing. Hattie was here a moment. They are going to give a supper tonight for the P. O. force. It is a gloomy dark evening though not cold. 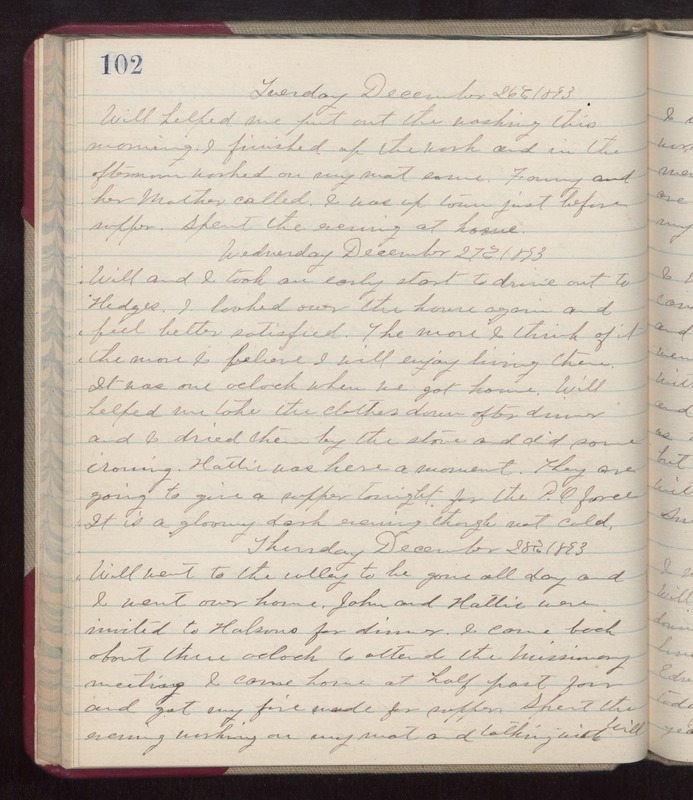 Thursday December 28th 1893 Will went to the valley to be gone all day and I went over home. John & Hattie were invited to Halsons for dinner. I came back about three oclock to attend the Missionary meeting. i came home at half past four and got my fire made for supper. Spent the evening working on my mat and talking with Will.